Size – Single 13,160 acre tract, approximately 10 miles long and 2 miles wide. Bidder Qualification Information – Must be received no later than Friday, January 2, 2015 by 4:00 p.m. Qualification documents may be hand delivered or mailed to DMLW Mining Section, Attn: Bill Cole, Suite 900B of the Atwood Building, 550 West 7th Avenue, Anchorage, Alaska 99501-3577. Bid Submission – Bids must be sealed and received no later than 4:00 p. m. Monday, January 12, 2015. Hand-carried bids may be delivered between 9:00 a. m. and 4:00 p. m. January 12, 2015 to the DMLW Mining Section offices in Suite 900B of the Atwood Building, located at 550 West 7th Avenue, Anchorage, Alaska. Mailed bids and bids sent by delivery service must be sent to the DNR Division of Mining, Land and Water, Attn: Bill Cole, 550 West 7th Avenue Suite 900B, Anchorage, Alaska 99501-3577. No bids or supporting material received or submitted to DMLW after this deadline will be accepted. Bid Opening – Wednesday, January 14, 2015 from 10:00 a.m. until all bids are read in Room 1270 of the Atwood Building, 550 West 7th Avenue, Anchorage, Alaska. Best Interest Findings to Offer Coal Leases – The Coal Lease sale is being held under AS 38.05.035(e)(6) and AS 38.05.150. On July 5, 2013, DMLW issued its Final Finding and Decision regarding the Competitive Coal Lease Sale in the Canyon Creek Area, Alaska, ADL 553937. The Competitive Coal Lease Sale in the Canyon Creek Area final best interest finding and appendices are available on the DMLW website at http://dnr.alaska.gov/mlw/hottopics/index.cfm, http://dnr.alaska.gov/mlw/mining/index.cfm, and at the DMLW, Mining Section Office in Anchorage. Americans with Disabilities Act Compliance – The State of Alaska, DNR, DMLW complies with Title II of the Americans with Disabilities Act 1990. This publication will be made available in alternative communication formats upon request. Please call the Mining Section at (907) 269-6848 or email william.cole@alaska.gov to make any necessary arrangements. The Canyon Creek Coal Lease Sale area is located in the Susitna Valley of Alaska, along the southeastern flank of the Alaska Range, on the lower east flank of Dickason Mountain. The sale area includes both the Canyon and Contact Creeks and their tributaries. The nearest community is Skwentna, nearly 18 miles to the northeast. There is no road access to the lease area. 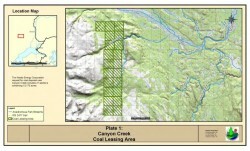 The Canyon Creek Coal Lease Sale area is undeveloped. The majority of the lease area is considered to have a “high potential” for coal development. Net coal thicknesses within the Tertiary rocks inside the lease block range from 5 feet to over 60 feet, with evidence from Barnes (1966) that some of the thicker deposits of coal may represent coal seams that are folded (and therefore thickened) or slumped. Please see the Competitive Coal Lease Sale in the Canyon Creek Area final best interest finding on the DMLW website at http://dnr.alaska.gov/mlw/hottopics/index.cfm and http://dnr.alaska.gov/mlw/mining/index.cfm for details about the data and bibliographic references utilized in this listing. The Canyon Creek Lease Sale Area lies within an region referred to as the “Cook Inlet Coal Province”, (Merritt and Hawley, 1986) that is a large coal-bearing region with four major Tertiary age coal deposits - the Broad Pass, Susitna-Beluga, Matanuska, and Kenai coal fields (named by Barnes (1967). The Canyon Creek coal lease area is situated adjacent to the Susitna-Beluga coal field. The Southern Alaska – Cook Inlet coal province is situated on a deep (up to 25,000 ft deep), actively subsiding Cenozoic fore-arc basin that formed between the Aleutian volcanic arc and the Aleutian Trench. The coal occurrences of the Cook Inlet region formed during Tertiary time as part of a large river system that emptied into the Pacific Ocean through the Cook Inlet (Wahrhaftig and others, 1994). There were two major forks of this river system, the alluvial valley of which is now occupied by Cook Inlet, extended northward through the area now occupied by the Susitna Lowland and Broad Pass coal fields and a second branch extended eastward through the valley that contains the Matanuska coal field. In general, the coals range in BTU content from 5,400 to 9,450 BTU/lb and have Ash contents of from 6 to 40%. They are generally very low in sulfur (0.1 – 0.2%) with moisture contents consistent with subbituminous rank coal (2-30%). Based on the coal drilling and outcrop examinations, where present within the Canyon Creek coal lease area, the coal is at relatively shallow and surface minable depths. Barnes (1966) indicates that there is evidence for slumping and therefore thickening of some coal seams, likely related to faulting in the area. Previous exploration projects have occurred in the area, most notably by Mobil Oil Corporation in the 1970’s. The Alaska Division of Geological and Geophysical Sciences (DGGS) used available drill logs from eight coal exploration drill holes drilled by Mobil Oil Corporation (Blumer, 1980; Mobil Oil Corp., 1977), thirteen outcrop localities from F.F. Barnes U.S. Geological Survey coal evaluation of the Beluga-Yentna region (Barnes, 1966), and three coal outcrop evaluations by R.D. Merritt (Merritt, 1990) (see Table 3.1). Based on the available data from drill holes and outcrop localities, DGGS estimates there are approximately 257.9 million short tons of Measured, Indicated and Inferred coal resources within the Canyon Creek coal lease area.